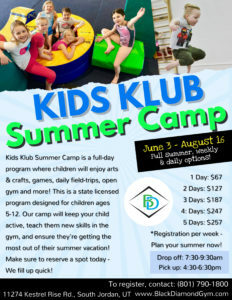 Kids Klub Summer Camp is a full-day program where children will enjoy arts & crafts, games, daily field-trips, open gym and more! This is a state licensed program designed for children ages 5-12. Our camp will keep your child active, teach them new skills in the gym, and ensure they’re getting the most out of their summer vacation! Make sure to reserve a spot today – We fill up quick! Registration is available for full summer, weekly, and daily campers. Registration opens during the last week of March. Providing a safe, fun, and constructive environment in which athletes will grow and achieve their goals. Together there is no limit to the positive impact we can have on the lives of children.